Thanks for signing up! Check your inbox for a confirmation email. 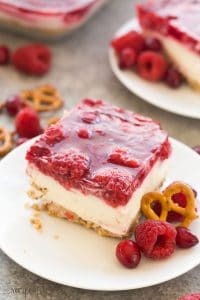 This Cranberry Raspberry Pretzel Salad Dessert is an easy holiday dessert salad that will be a big hit at Christmas or Thanksgiving! Made with cream cheese, fresh fruit and real fruit juice instead of Jello and includes a step by step recipe video. First of all, let me tell you that I know there are a lot of people who look at these….. “pretzel salads”, and scratch their heads. What says “salad” about that?!? But, since I am not a fan of any leafy salads except for good ol’ taco salad, I’m jumping on the pretzel salad train with glee. May all salads have cream cheese and crushed pretzels and fresh fruit and a homemade Jello layer from now on. When I came up with the idea for this…. “salad”, I wanted to use as much Real Food as possible. That is really my goal here, and while I’ll never deny I have a few boxes of cake mix and KD in the cupboard for emergencies, we cook from scratch whenever possible. And so, I cut out the Cool Whip and the Jello. I hope you aren’t mad? (Confession: I do have Cool Whip and Jello in my home. For, you know, whipped cream emergencies, but like I said above — I want to show you you can make a fun pretzel salad without them! Judge me all you want). Let me just say that we absolutely devoured this! 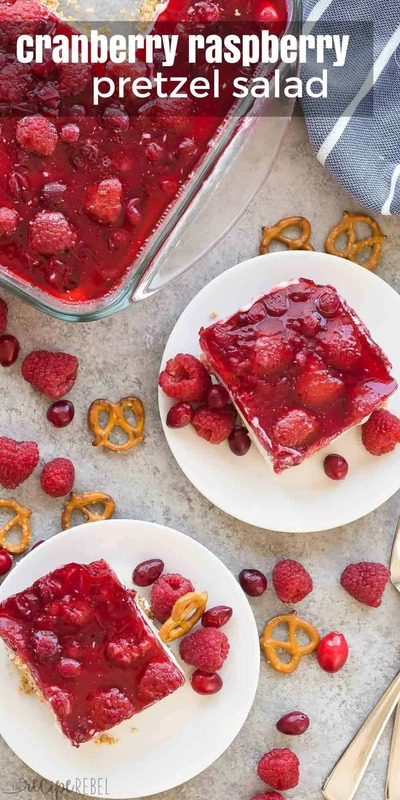 The cranberry raspberry flavors are perfect for Thanksgiving or Christmas, but it’s totally no bake so it works just as well as a summer dessert. It’s win-win, if you ask me! Instead of the Jello, I use unflavored gelatin to set some real fruit juice — you can buy the low sugar or low calorie juice if that’s something you’re concerned about, or you can buy the all natural 100% fruit juice if that’s your thing. Either one should work just fine. Don’t have cranberries or raspberries? Use whatever berries you like! Strawberries, blueberries, blackberries, even mandarin oranges would be great! Feel free to mix up the flavor of juice as well, but stick with clear (no pulp) apple or berry juices for best results. This recipe is great for making ahead! Since it needs some time to set, you can make ahead and store in the fridge for up to 24 hours before serving. Watch the recipe video and see how easy it is to make! In a medium bowl, combine crushed pretzels and melted butter. Press firmly into an 8×8″ pan. In a large bowl, beat cream cheese with an electric mixer until smooth. Add cream and sugar and beat on high until light and fluffy, about 4-5 minutes. Spread over pretzel crust and refrigerate. Pour 1/2 cup of the juice into a small bowl and sprinkle gelatin over top. Set aside. To a large skillet, add remaining 1 1/2 cups juice and cranberries. Bring to a simmer and cook for 4-5 minutes, until cranberries start to burst (I prefer not to have whole cranberries in my “salad” because they are tart — you don’t have to cook them until bursting if you want them whole!). Place juice and gelatin mixture in the microwave and cook on high for 10 seconds. Stir to dissolve the gelatin and add to skillet with juice and cranberries. Stir in raspberries and sugar (optional — the berries are tart so I added a little! Feel free to taste and adjust). Remove from heat and let cool to room temperature. Pour over cream cheese layer and refrigerate until completely set, at least 3-4 hours. Slice and serve. *You can easily make this recipe to fit a 9×13″ pan to feed a crowd — just double it! [br]**Nutrition information is estimated and will vary depending on exact serving size, types and brands of products used. This information was calculated using unsweetened real fruit juice — using low calorie fruit juice will reduce the calorie and sugar count further. In a medium bowl, combine crushed pretzels and melted butter. Press firmly into an 8x8" pan. Pour ½ cup of the juice into a small bowl and sprinkle gelatin over top. Set aside. To a large skillet, add remaining 1½ cups juice and cranberries. Bring to a simmer and cook for 4-5 minutes, until cranberries start to burst (I prefer not to have whole cranberries in my "salad" because they are tart -- you don't have to cook them until bursting if you want them whole!). Place juice and gelatin mixture in the microwave and cook on high for 10 seconds. Stir to dissolve the gelatin and add to skillet with juice and cranberries. Stir in raspberries and sugar (optional -- the berries are tart so I added a little! Feel free to taste and adjust). *You can easily make this recipe to fit a 9x13" pan to feed a crowd -- just double it! **Nutrition information is estimated and will vary depending on exact serving size, types and brands of products used. This information was calculated using unsweetened real fruit juice -- using low calorie fruit juice will reduce the calorie and sugar count further. Tried this recipe?Tag @thereciperebel or hashtag #thereciperebel -- I love to see what you're making! My daughter is busy hand-making a cute baby Mobile and decided to buy a pantry to hide all her baby supplies in the kitchen. Now she is rearranging cabinets! Hope you’re taking it easy! Thinking of you as I am making your Pretzel salad. It’s still in fridge waiting for my Gnocchi dinner to be done. It looks DEElicious, I’m sure I could EAT the whole thing! Thanks for the recipe. Thanks Joan! I am taking it easy now — I’ve done a lot of work the last few months to get ahead so I will have some time off when the new baby comes. I hope that you love the pretzel salad! I like the way you think! OK, what about a chocolate cream pretzel crust salad?? Great recipe, we don’t have Jello products here, so your recipe works well for me. I certainly see a place for it at our upcoming annual “American Thanksgiving in Sweden” party. Oh I can totally get on board with that! Yum! I like jello salads but THIS sounds AMAZING! I think I might have to add it to my Thanksgiving menu! Thank you so much Char! I hope you enjoy it! I’m totally down for salads like this!! 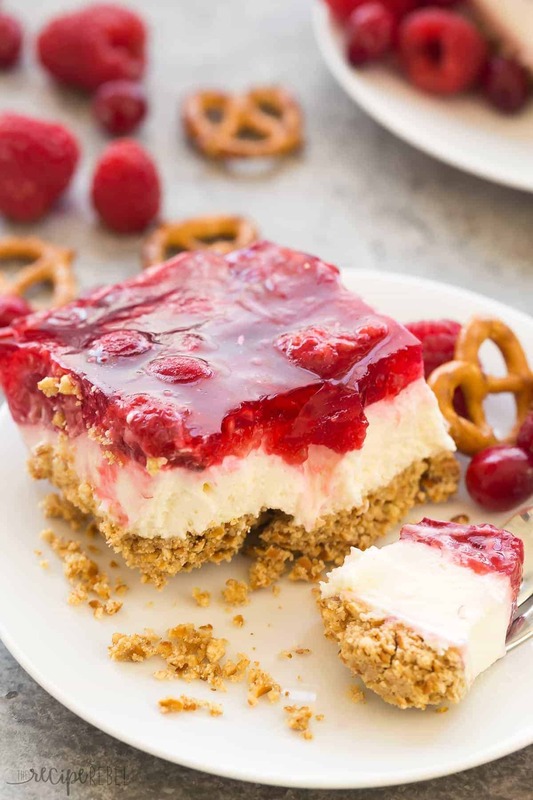 That pretzel crust seriously looks AMAZING, Ashley! This would be so perfect for Thanksgiving or the upcoming holidays! My name is Ashley and I love to cook and bake. I also like to do things my way, which means eyeballing, improvising and breaking the rules when necessary. Here you will find creative twists on old favorites and some of my favorite family recipes, passed down from generations! This site contains affiliate links. I make a miniscule percentage if you click through to one and make a purchase. Thank you for helping me bring you more great content!